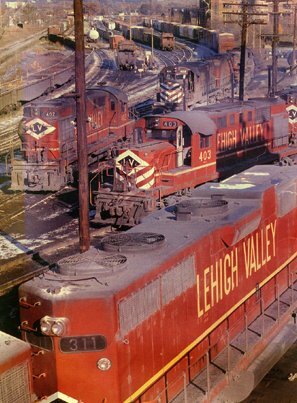 This image was taken by Don Ball Jr. and featured on a northeast railroad calendar during the 1980's. This image was taken from the former foot bridge on Lockhart Street looking north . On the extreme left is Lehigh Avenue and in the upper right you can see the former Sayre Powerhouse which supplied all the electric power and steam to the Sayre shops and Robert Packer Hospital.